Tuesdays–Saturdays, 9 a.m. – 4:30 p.m.
Capitol Park Museum will be closing early Saturday, May 4 at noon for a private event. Thank you for understanding! For more info on educational opportunities please email [email protected]. From Louis Armstrong to Huey P. Long, from Mardi Gras to fais-do-do, and from the nation-building commerce of the Mississippi River to the life-sustaining bounty of the Gulf of Mexico, the Capitol Park Museum provides a panoramic exploration of the most vibrant state in America. See how American Indians; colonists from France, Spain and Britain; enslaved Africans and Acadians from Nova Scotia—eventually known as Cajuns—populated and cultivated Louisiana, shaping it into one of the most culturally rich regions in the world. 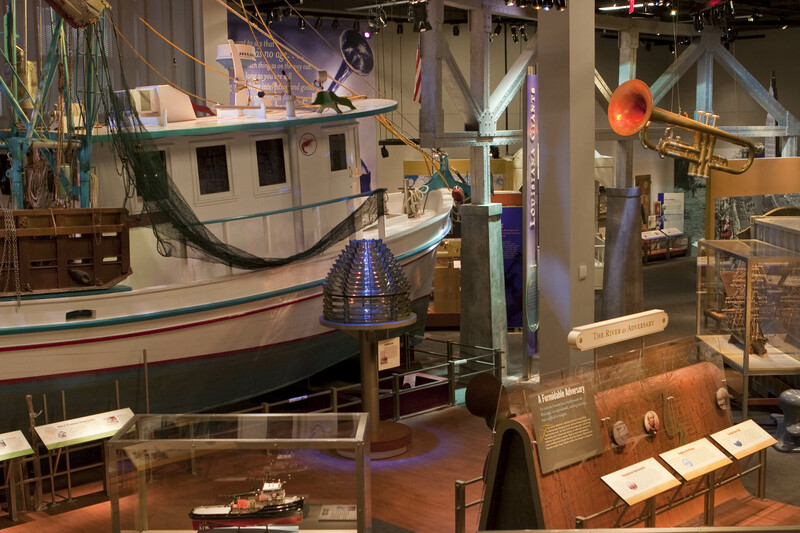 With thematic exhibits on diverse aspects of Louisiana history, industry and culture, the museum includes two permanent exhibits: Grounds for Greatness: Louisiana and the Nation and Experiencing Louisiana: Discovering the Soul of America. A 48-foot wooden shrimp trawler and a two-row sugar cane harvester reveal by example the state’s agricultural and aquatic riches. An oil-well head and a scale model of a drilling rig drive home the critical role Louisiana plays in America’s energy industry. Exhibits also include a rare Civil War submarine and artifacts from steamboats, including trophy antlers won by the Robert E. Lee in the Great Steamboat Race of 1870. Exhibits on slave markets, resistance, revolt and Jim Crow provide a glimpse into the unimaginable plight of people of color who, in the face of overwhelming hardship, contributed incalculably to the cultural fabric of the state. The museum re-creates the atmosphere of holding cells where slaves bound for the auction block were imprisoned to prevent escape. The exhibit includes the actual door from the Fairview Plantation jail for slaves. The fight for freedom is highlighted in a display on the Baton Rouge bus boycott of 1953, which made national headlines and inspired civil rights leaders throughout the South. Louisiana offers much to the musical history of the nation as a whole, and many of those vital contributions are on display. See eclectic exhibits on the state’s music and musicians, including Pete Fountain’s clarinet, Buddy Guy’s polka dot Stratocaster guitar, Clifton Chenier’s Grammy award and, in the expansive Louis Armstrong exhibit, the bugle “Pops” played as a boy at the Colored Waif’s Home, where he received his first formal music instruction. In the interactive music exhibits, hear the distinctive southwest Louisiana sounds of Cajun, zydeco and swamp pop, Baton Rouge blues and world-famous New Orleans jazz. The Capitol Park Museum tells a story of passion, adventure and discovery that could have happened only in the Bayou State. Come explore a way of life like no other. Our beautiful museum makes a great backdrop for your professional photography session, but before you visit please contact us. Learn more about professional on-site photography. I AM MLK Jr | Event Honoring Martin Luther King Jr.
Free admission to Capitol Park Museum on Halloween day when wearing a costume! Tag us on social media @LAStateMuseum, we love to see all the fun! Dr. Rebecca Saunders will speak on Louisiana’s Native American earthen mounds at noon on Wednesday, October 17th. A full day of panel speakers, artifacts on view, refreshments, and food trucks. Join us for this first event in Archaeology Month on Saturday, October 6 from 9 a.m. to 3 p.m.
Humberto Fontova will speak about his book, Crazy on the Bayou, Wednesday, August 8 at noon. Louisiana residents are invited to join Forum 35 for the grand opening of the Art Melt exhibit. The first day of this six-week exhibit is free and open to the public between the hours of 4-9 p.m.
Our mission is supporting the Capitol Park Museum in efforts to grow awareness through education, events, and exhibits. Become a Friend of the Capitol Park Museum today!